Ever since I saw on Kitchen Riffs pickled watermelon rind recipe, I couldn't stop thinking of it. Then last weekend we bought watermelon that was not as tasty as it should, or simply as expected. Perfect to put pickling recipe to the test. But instead of following John's recipe, I went Google, and found this. Omitting ginger, I followed the recipe. During the process I couldn't wander of ratio: 2 cups vinegar and only 1/2 cup sugar? It didn't make a clear sense to me, nevertheless I proceeded. That evening I proudly set my creation in the center of the table for our dinner. We tried it, and run away from the table to spit it: it was just pure vinegar! I didn't through pickled watermelons away, instead, I added another portion of watermelon and radish, poured all the liquid from the jars, diluted it with more water and sugar to balance the vinegar, mixed all fresh and pickled ingredients together, covered it with pickling liquid, and then spooned back into the jars. Next day we tried it again. 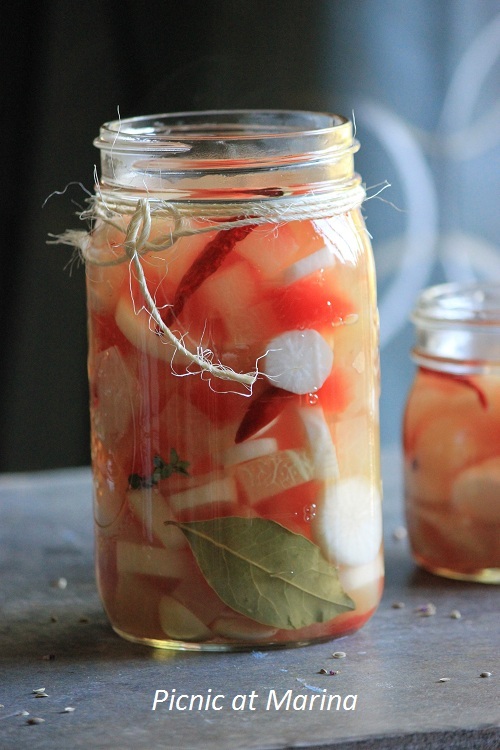 It was much better, and edible: we could taste watermelon and radish, and not the vinegar. great condiment for salads, meat, sandwiches, or whatever else you use pickles. Although the corrected recipe worked, both, teenager and Mr. I.V. asked why did I make it with the vinegar? Then teenager added: "make the one grandmother makes". Yes, why it didn't come to my mind to look into my mother's recipes? I couldn't call her that day: it was an early morning where they live and I don't think mother would understand that I really called her to find out her pickled watermelon recipe at 3 AM. She would call me back all day to ask me what happened. So, to keep my mother worry free, I didn't call. Instead, I looked at my recipe book, and what did I found? In my mother's handwriting the pickled watermelon recipe, that she cared to write when she was here last January! 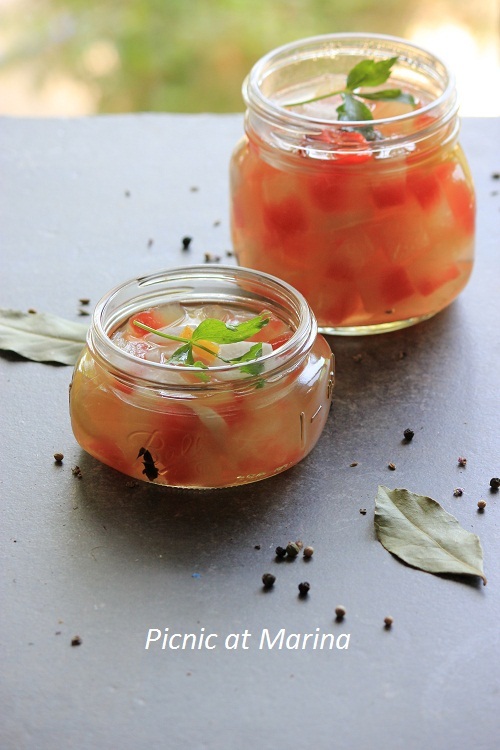 I haven't done my mother's pickled watermelons yet, I still need to talk to her about some details, and then I will share the recipe with you. Have you had any cooking mishaps lately? Oh, don't you just hate it when that happens!!! I looked at the recipe and it seems like there's not nearly enough water. I love pickled watermelon and have posted it, made by my son. My mom made it every summer but sadly I don't have her recipe. I've made my share of mishaps--and just recently made a pasta dish that had a sickening sweet sauce. It went in the garbage and we ate toast and PB for dinner. What a great idea for a recipe! It sounds wonderful. ok this is crazy but my grandma used to pickle watermelon rinds and i adored them so much that about 7-8 yrs ago I found an online source that was selling them and after paying the shipping on them, it was literally like a $20 jar of pickles and half the juice leaked in transit and they were no where near as good as hers! when i was into canning in the spring this year, I almost wanted to make them but no watermelon and now, I am just...wondering if I should attempt or just let the memory of hers live on in my mind. yours look beautiful (after salvaging them!) -people are far too stingy with sugar these days. Those old farm ladies were not shy with it! Averie, that's was my motivation too: I remember eating it at grandmother's house, then my mother also made it. And they tasted so good, that this taste memory followed me each time I had a fresh watermelon. if you post the updated recipe and figure out what works, approximately, LMK when the post is up. Will be curious to try it! Like you, my grandmother's recipe lives on in my mind and I always wonder if there will ever be a way to duplicate it! this is totally new to me. Never heard of this before. What an interesting idea. I'd love to try it. Bookmarking. After I fixed it, tasted good too. I am working on formula for the brine, and will post some day about it again. :) What recipe did you use? I have pickled a number of veggies but never watermelon rind. In fact I just pickled some tomatoes the other day. This sounds really interesting and looks tasty. I am going to have to try this out. Hope you are having a lovely weekend. hehe, I can just picture you all running from the table. So glad they tasted better the next day. They sure are pretty! Hehehe, sometimes it happens in the kitchen. But I think that this is necessary to learn a few things. I have encountered a lot of mishaps in the kitchen. Sometimes some things can be fixed and can become better like your pickled watermelon but sometimes nothing helps and some things are really inedible and have to be thrown away. I have e.g. some issues with muffins. One day I added to much soda into them and they were bitter and they ended up in the dustbin. But the other day I also baked muffins that were not the best muffins I have ever had but still edible. Since I don't like throwing food away I decided to put them in the freezer that I have in my office. When I was superhungry and wanted something sweet those muffins were better than nothing. ahhhh. 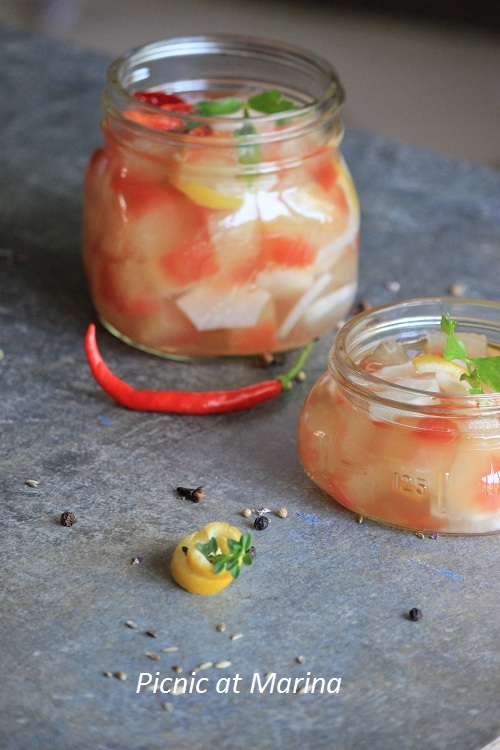 I did make pickled watermelon rind before and just didn't like it! I can't remember what recipe I used, or what I didn't like about it, I just remember throwing them all away! lol I can't wait to see your mother's recipe! Gosh, thanks for the link! I appreciate that. I'm dying to see your mother's recipe. There are so many different ways to pickle anything. BTW, Joy of Cooking is a great resource for old time recipes, particularly if you can find one of the older editions (published before 1990). I've never tried this! Very cool. Thanks for sharing! My mum makes these, and they are so divine... yum. They came out really good, actually. Does your mom use vinegar? You are pickling things a lot, lately -)) Good for you! It's always reminds me a time from my child home. I do a lot of jam, and preserves with fruit. Ah, I don't know - a good dose of vinegar never hurt anyone :D But seriously though, it's so sad when that happens and you just feel like all your hard work is for naught. Really good you could salvage it though. I've been wanting to make pickled watermelon for ages - I love the idea of using every single little bit, right up to the outer shell, because after you've eaten the red flesh, the whitey-green part is still perfectly edible, just not sweet and juicy! And now you made me think of it. I'd love to have a jar for a cold winter days. Indeed... :) was all worth it though! Very interesting use of watermelon rinds! I can just imagine the texture being similar to a daikon radish. What an interesting recipe! I've never heard of pickled watermelon rind before, but then again I'd never heard of watermelon rind jam either until recipe. Sounds fantastic. 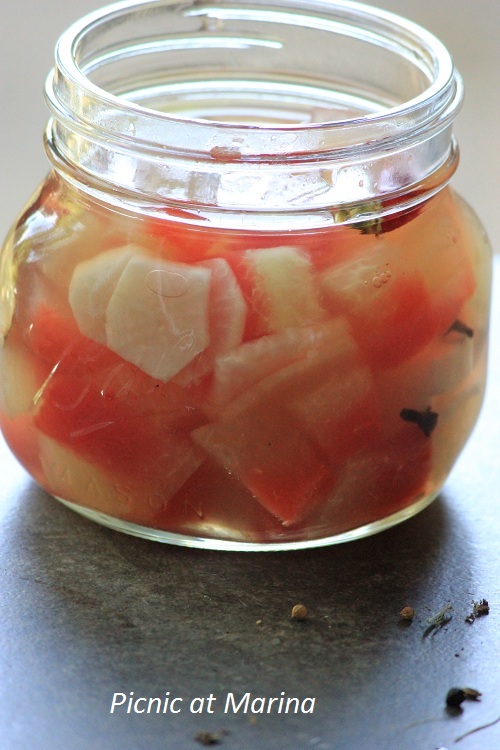 I remember John's watermelon rind pickles. I really need to try this - I only eat the sweet part of watermelon so this is a good reason for me to keep eating the only red parts of watermelon. :D Thanks for sharing your version! Shame it started off with some problems, a really interesting recipe. Oh believe me Marina I had and still have many misfortunes in my kitchen, but I think this is part of the process too. You learn better from your mistakes rather than from the successes! I can't wait for your mother's recipe! Now this is something that I would like to try out. And to think of all the rind that I threw away all these years..... sigh ! !